I was looking for a lightweight dressy raincoat w all the rain we are having. Both sides are well made. Wearing to a Theatre show this weekend. Will follow up with the practicality of this feature for event. Universal Direct Brands offers products from our own and other major national brands. We want to share our unique collections and have many exclusive items that we've developed for you. Your satisfaction is our most important goal. You may return your purchase at anytime, for any reason, and receive an exchange, credit or refund. If you have any concerns, please email us at shop@universaldirectbrands.com or call 1-855-840-5333 toll free between 9 a.m. and 7 p.m. EST Mondays through Fridays. For customer service inquiries or to initiate a return, please contact Universal Direct Brands at shop@universaldirectbrands.com or 855-840-5333. Rainy days are the best days in this fabulous shiny jacket. Iridescent fabric on one side reverses to a complementary hue on the other; a toggle-tightened hood lets you create a snug collar when the hood is more than you need. 100% polyester. Imported. Choose Amber, Merlot or Navy. S(6-8), M(10-12), L(14-16), XL(18), 1X(18W-20W), 2X(22W-24W), 3X(26W); 32"L.
• IRIDESCENT RAIN JACKET - Add some fashionable shimmer to your rainwear with this iridescent rain coat. • REVERSIBLE JACKET - Flip it to the light or dark print depending on your mood and outfit. • OVERSIZED BUTTONS - Noticeable buttons add a cute touch when you wear it closed. • TOGGLE-TIGHTENED HOOD - Attached hood has toggle in lining so you can create a snug collar when the hood is down. • A GREAT GIFT - Get one for the girl who must look fashionable at all times, even in the rain. Lots of compliments on this coat, loooooove the color and fit. However it's not waterproof. For fashion only, nice for crisp fall weather. 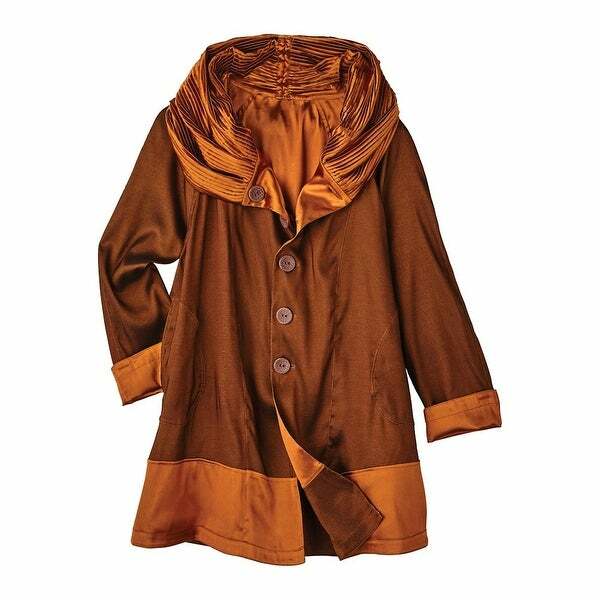 Love this rain jacket for spring & summer, just enough to keep you dry & not hot beautiful color, day one side the evening the other side for a little dresser. Have recommend to many frends. While it is a beautiful two-toned blue, obviously it was not make for someone who is 5'6". The pockets almost right under my arm pits--so unless I lower them, they are not usuable. The sleeves are very long, but at least you can turn them up, as pictured. The hood was cut WAY, WAY to short to serve as a hood, more as a high collar--even when it is let out as far as it will go. Since I didn't realize the "problems" until I put it on, I will keep it. Got it to walk my dog, so it will do. I love this rain jacket. Beautiful color and stylish. I have already gotten compliments. I would recommend this to my friends. It even was delivered 2 days before I expected it. So pleased with this purchase and every time that I wear it I received compliments I like that it's reversible and different.This is my first purchase of a raincoat.The hood is what sold me on this coat, it's larger than I've seen on other coats. great style and colors. Fabric a little noisy. I really like this jacket. color is perfect match for what I bought it for. Item is very pretty with a chic look, however it is not true to size. RETURN for a full refund. Paper thin, useless "coat", cheap and dreadful. I returned it but still have not gotten my money back. "Does it run true to size chart?" I like the contrast between the two shades and textures of amber.